You may have heard. 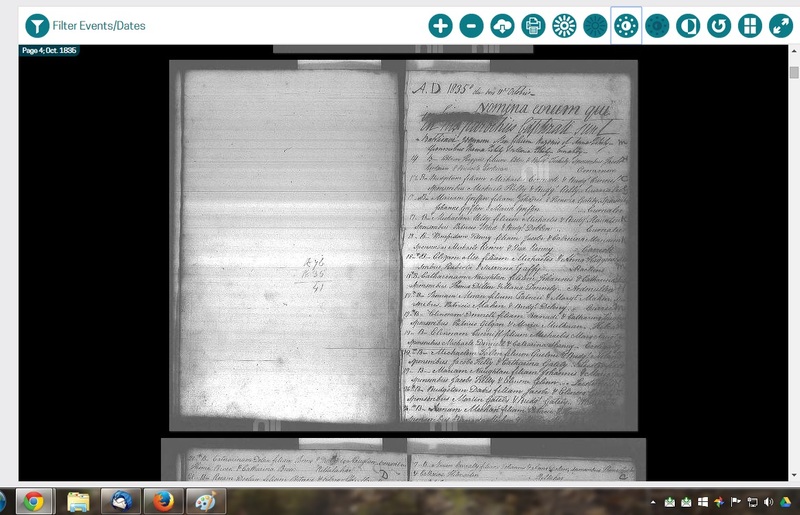 The National Library of Ireland website now has the Catholic Church Parish Register records online and available to research for free. The records are available to research for free. I’ve been waiting a long time to get my hands dirty with Irish research. To say I am eager to begin this research is an understatement. It’s important to know the parish before you start your search. It isn’t good enough to know the county. Each county has several parishes. 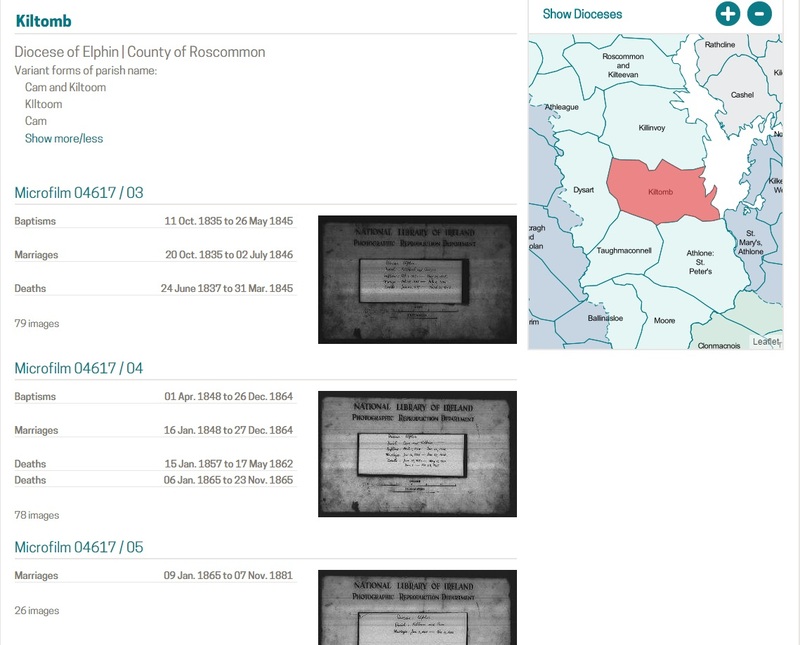 Before you can begin with these records you must learn the name of the parish your ancestors lived in. On the main screen, I entered Cam in the search box. 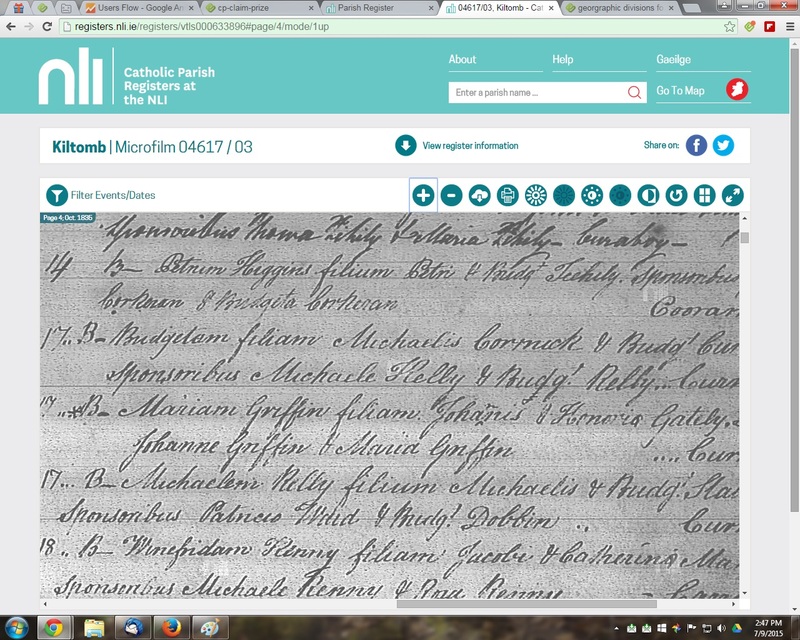 The next screen shows that Cam is included in the parish records for Kiltomb. It’s also known as Cam, Camma, and Kiltoom. This is in the Diocese of Elphin. The records start with 1835 and go through 1865. Marriage records extend to 1881. Further research showed that these are the earliest records for this parish. Let’s talk about the research page. Click on where it says Microfilm and the reel number to begin researching. It’s really well designed. They decided to keep the feel of a microfilm reader. It is easy to scroll up and down and side to side within the records. The funnel takes you directly to a specific date within the records. The + and – make the text larger or smaller. The cloud allows you download the page to your computer. The printer symbol allows you to print the page. The four sun symbols allow you to play with the brightness. The dark and light circle allows you to switch from black on white to white on black. The circle arrow resets the image to the default view setting. The four blocks allow you to see thumbnails of each image. The two arrows in a circle allow you to switch to full screen mode. Note: If you’re on a mobile device, many of these filters/controls appear under the sprocket which is on the left hand side next to the funnel. Click on the sprocket to see all options. The records are fairly easy to read. There are no indexes so you’re going to have to work through page by page. Though in Latin, it is easy to make out the format. If you’ve been through church registers then you know the format. There aren’t a lot of word variations. The one thing one needs to watch for is the first names are in Latin. I came across this in the catholic church records on Kauai, Hawaii, where it was funny to see Portuguese people named Antonius and Johannem. Some are obvious like Michaelis for Michael. Others need to be researched. Okay, I admit it. I am disappointed. Not only does it not include the decade I need, many of the records don’t give the names of parents or grandparents, so even if I find possible matches I may not be able to determine without a doubt that they are my people. I’m not one to give up easily. First, I need to determine if the people in Cam had their events recorded in another nearby parish or if the records really were in Kiltomb are were lost. I have reason to believe that the records I need which prove a relationship between Patrick Dolan and his siblings exist. When his probate was refiled in 1907 (the originals were lost in the 1907 earthquake), a representative was hired in Athlone who provided evidence of the relationship. Unfortunately, the refiled probate only includes the questions asked, it doesn’t include the answers. Then, I’m trying to find Patrick’s sisters, Margaret (Dolan) Coyne and Bridget Dolan. I’ve written about Margaret in my article: I am tired of you, Margaret (Dolan) Coyne. I’ve wasted plenty of time trying to find them in the US. I suspect that was an error and they might not have left Ireland after all. The problem is going to be whether there will be enough information in the records to make a determination. That doesn’t mean I won’t try! I may just record every Dolan and Kelly in the parish and see if there are connections. Do you have Irish ancestors? Which records will you be researching? If you’re on a desktop or laptop, the only thing I can think of is that it might be appearing differently on your browser or anti-virus software is somehow blocking features. You might try a different browser to see if it appears differently. Kamla, thanks for your comments! I did a little research and realized that the website looks different on desktop than it does on mobile. If you’re using a mobile device, look for a sprocket on the left hand side. Most of the controls are in that drop down menu. If you aren’t on mobile, I would try switching to a different browser or seeing if your anti-virus software might be blocking the controls (maybe try turning it off to see if the website looks different). Hope this helps! I’m so sorry you reached another wall. I know how that feels! Yes, I do have some Irish ancestors, but I’m having trouble identifying exactly who they are so I can trace them back to Ireland. I have a couple of names, from a public family tree that includes some of my people. Alas, the person who added those names left no trace or clue as to their sources, so they remain nothing but names for now, and I can’t be sure they really are my ancestors. I’ll keep hunting! Thanks so much for following my web site. I hope you find much to enjoy or think about there. Kathryn, Thanks for stopping by! Research can be frustrating, can’t it? Even more frustrating with public family trees where you can’t verify the information given. I have now learned a couple I was following is not the right one. At least, I’ve ruled them out. I still feel there are records out there because something was used in 1907 to prove relationships over a contested will. Ruling out is a tiny bit satisfying, just to be able to move on, but also disappointing, isn’t it? Crossing my fingers you find it soon! Kathryn, We aren’t lucky every time we research to find exactly who we are looking for, so ruling out families is so important. Disappointing, but important.